How to Convert SFP to Ethernet? SFP ports and RJ45 ports are the most common interfaces which are used in Gigabit Ethernet applications. And we complete the fiber to Ethernet or Ethernet to fiber conversion via these ports. How much do you know about SFP ports and RJ45 ports? And do you know how to convert SFP to Ethernet? This article will explain these questions. SFP ports are the input and output interfaces that are able to be hot-pluggable. They are seen in network switches or network interface cards. And SFP port is capable of working with the standards of 1000BASE-SX, 1000BASE-LX/LH, 1000BASE-ZX or 1000BASE- BX10-D/U. At present, network switches are usually designed with two or more SFP ports, which comply with IEEE 802.3ab standard. Note that in all cases, the SFP transceiver module must be inserted then the SFP ports can work. 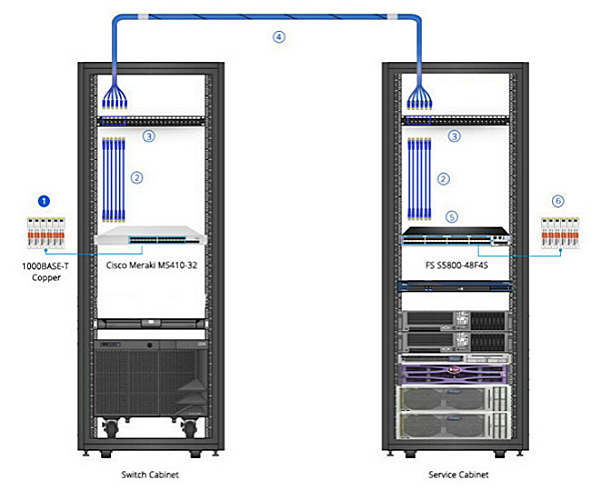 The ports make it possible for Gigabit switches to connect to the fiber and copper cables, converting SFP to Ethernet or Ethernet to SFP and completing the switching function. RJ45 port, which stands for registered jack 45, is the ubiquitous Ethernet style data port seen on switches, routers and network cards, following the 1000BASE-T Ethernet standard. It only supports RJ45 cables like CAT5e, Cat6 with the transmission speed of 1Gbit/s. By far, the most common use of RJ45 port is with Ethernet data connections from computers network cards, wireless access points, network switches and routers in home and enterprises networks. RJ45 ports on a data switch use the built-in design. Connecting two RJ45 copper switches, we just need a Cat5e or Cat6 copper cables. But if we want to convert Ethernet to SFP, an RJ45 SFP transceiver is required. From the above, we have a good understanding of SFP ports and RJ45 ports. They are the interfaces for converting SFP to Ethernet or Ethernet to SFP. But how? Here FS provides two solutions for you. As we have mentioned above, the network switches on the market are generally equipped with SFP ports. Thus, under this circumstance, we can use SFP modules to complete the interconnections between switches or servers. Insert the Ethernet SFP module into the network switches, then plug one end of Cat5e or Cat6 cables into the transceivers and the other end is connected with other terminal devices. This figure shows how we can use SFP transceiver for our conversion need. We can see this is a full solution, covering the following equipment. If your switch doesn’t have SFP ports, then you need an Ethernet media converter. It’s a device used to interconnect fiber and copper cables to facilitate communication between them. This device looks like a small box where fiber and copper cables could be plugged in. Here is the SFP to Ethernet converter from FS.COM. It has one RJ45 port and one SFP port. And the mini converter can support 1000Base-X to 10/100/1000Base-T UTP convention. Designed with compact package size, it’s a reliable plug and play converter. Therefore, just plug the fiber and copper cables into the slots and connect the other ends of cables to the terminal devices, ensuring the whole network works properly. The following video shows you how to use FS fiber optic media converters to convert SFP to Ethernet. Using SFP transceiver module or Ethernet media converter can help us convert SFP to Ethernet, which can better expand network function. FS.COM offers an extensive choice of full SFP to Ethernet or Ethernet to SFP solutions. Choose FS.COM for the right product to meet your conversion project needs.